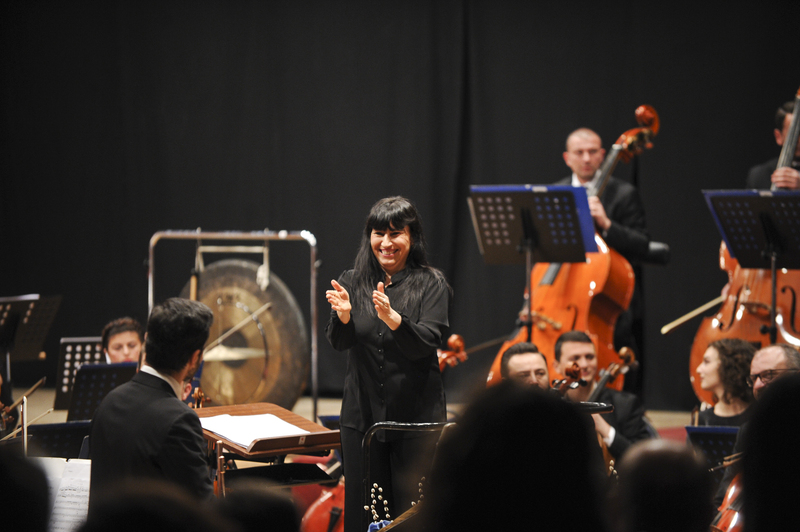 Nathalie Marin, resident conductor of the Kosovo Philharmonic Orchestra, shares her thoughts on performing in Kosovo, celebrating traditional culture and changing the face of classical music. Guiding the 70-strong philharmonic orchestra was French conductor Nathalie Marin, who has directed musical performances with the Kosovo Philharmonic since 2014. Marin’s musical career has taken her across the globe, from Germany and France to Cuba and Ecuador. In between her busy rehearsal schedule for Sunday’s concert, she sat down with Prishtina Insight to talk about why Kosovo is one of the most interesting places she has had the opportunity to perform. Kosovo Philharmonic Orchestra in the Red Hall of the Palace of Youth and Sports. Photo: Atdhe Mulla. 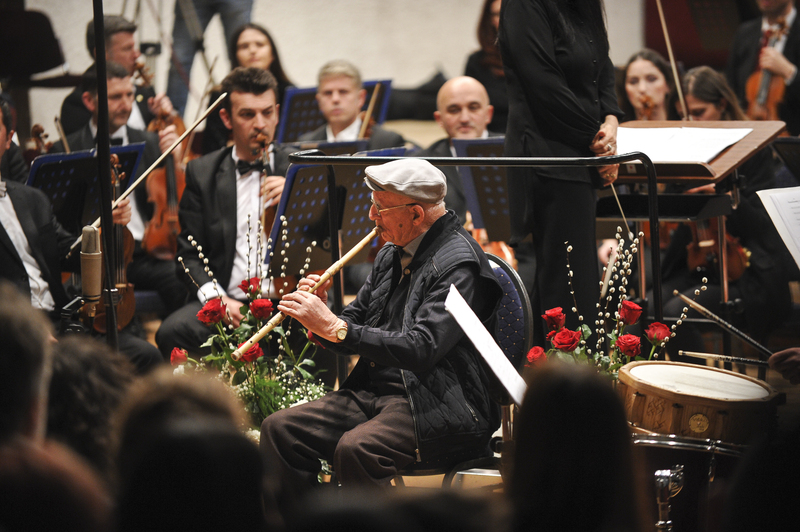 Marin explained that the youthful atmosphere in Kosovo and the accessibility of art and culture means that even more traditional kinds of music, like the Philharmonic Orchestra, remain both fashionable and fun. “Walking the streets of Kosovo, there’s something so exciting about being here and performing here. Kosovo’s a small country and Prishtina is a small town, but with such a young population it feels so vibrant. It reminds me of being in Cuba in that way, I feel like a teenager again there, too,” she said, ringing back to the days when she conducted the National Symphonic Orchestra of Cuba. Despite her successful career focussing on classical music, Marin has aspirations beyond rehashing Mozart and Haydn, and according to her, Kosovo is one of the perfect places to explore the unexplored when it comes to new ideas for composers, conductors and classical musicians. Marin was excited to tick both of these resolutions off her list for Kosovo’s first philharmonic concert of the new year. The concert last night began with traditional classical music from Mozart and Haydn, but also a short concertino for the flute and orchestra by Cecile Chaminade, a French woman composer and pianist from the 19th and 20th century. Marin applauds for flute soloist Bulent Evcil. Photo: Atdhe Mulla. The second half of Sunday’s concert was a shock to the system, a brand new composition from a young Albanian composer. A solo flute, percussion instruments, piano and a kavall — a wooden flute commonly found in the Balkans, Turkey and the Caucasus — played alongside the full orchestra in a contemporary performance from soloists Eremira Citaku, the flautist and concept artist that runs the Flute Sounds festival in Kosovo, and Shaqir Hoti, a celebrated maker and player of traditional Albanian wind instruments. Liburn Jupolli accompanying the Kosovo Philharmonic Orchestra. Photo: Atdhe Mulla. Despite celebrating the composition of Cecile Chaminade on Sunday, representing work from women composers has always been a challenge, according to Marin, but the lack of women’s representation did not stand in her way when she chose to pursue classical music. “I didn’t come from a family with a musical background, I just knew that I wanted to work with classical music, and a little later on that I wanted to be a conductor. I can’t really explain it,” she said. Marin trained at the Danish Royal Academy to specialize in conducting in 1999, working as the assistant conductor of the Royal Danish Opera in Copenhagen. Even before this, from 1991, she was the artistic director of the Ensemble Orchestra d’Isere in France. More recently, from 2011-2013, Marin worked as the artistic director of the National Symphonic Orchestra in Ecuador, and has been the permanent conductor of the Mersin State Opera in Turkey since 2017. Among many opportunities, working as a guest conductor has taken her to Mexico, Italy, Argentina and China. This is the fourth time that her work has brought her to Kosovo. Marin spent the last week before the concert preparing with the Kosovo Philharmonic, and explained that her role is to shape the composition, and the orchestra, towards her vision of the music. “It’s not just thematic interpretations of the music, but technical skills that the conductor helps with, too. The job of the conductor is to convince sometimes up to 100 individual musicians, artists at once that your interpretation of the music is the right one,” she said, laughing. Marin conducting the Kosovo Philharmonic Orchestra, January 13. Photo: Atdhe Mulla. Marin said that working with orchestras that are influenced by and enjoy celebrating their own traditional music is a passion of hers, and that working with Shaqir Hoti has been a highlight. 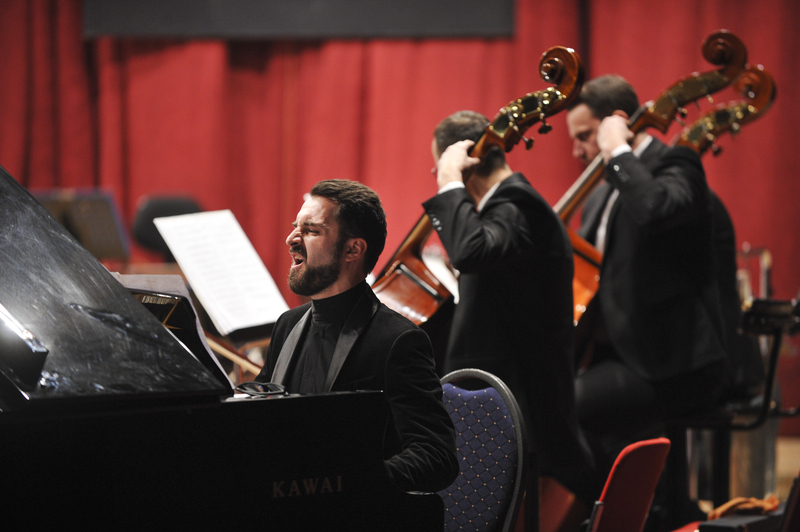 Shaqir Hoti playing the kavall with the Kosovo Philharmonic Orchestra. Photo: Atdhe Mulla. Marin believes that celebrating young new composers, women, and contemporary music are all fundamental for the development of music, along with using more unconventional spaces to perform in. “It’s scary for us to always be looking at the past, and there are ways to enjoy classical music while still looking forwards,” she said. Marin is thankful that the French Embassy has continued to support hers and others’ work across the world to bolster art, music and cultural development. “The French Embassy has been a huge help, and despite the social problems existing in France they have kept up these cultural exchanges in places that really need it, like Kosovo,” said Marin. According to Marin, one of the things Kosovo really needs is a proper music hall. While she enjoys playing in Kosovo, the acoustics in the Red Hall are not suitable for orchestral performances. Kosovo remains the only country in the region without its own opera house. While plans have been in place to build a concert hall in Prishtina since 2010, controversy over its location and funding issues have continuously hampered its construction. “It is essential for a country’s culture to have a place just for music,” she concluded. 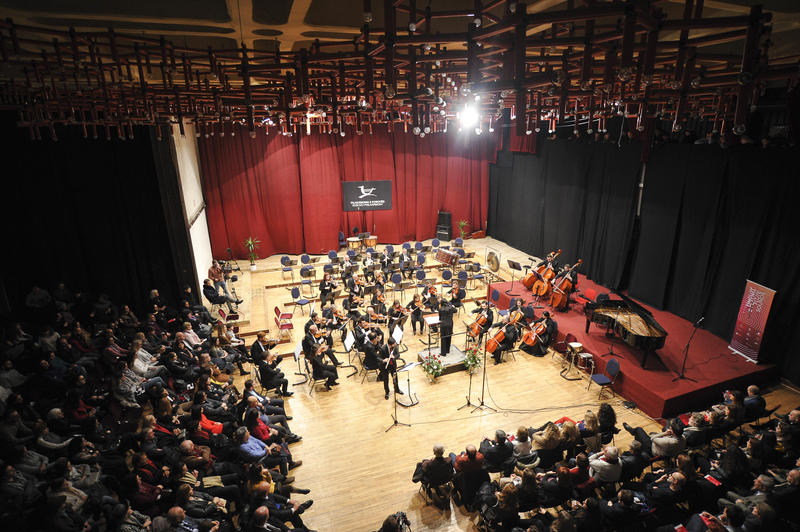 *The Kosovo Philharmonic will play again at the Red Hall on January 27, as well as March this year at Dam Festival, the international young musicians festival held in Prishtina. The Flute Sounds Festival will continue from Tuesday, January 15 with performances at the University’s New Amphitheater at 6 pm. 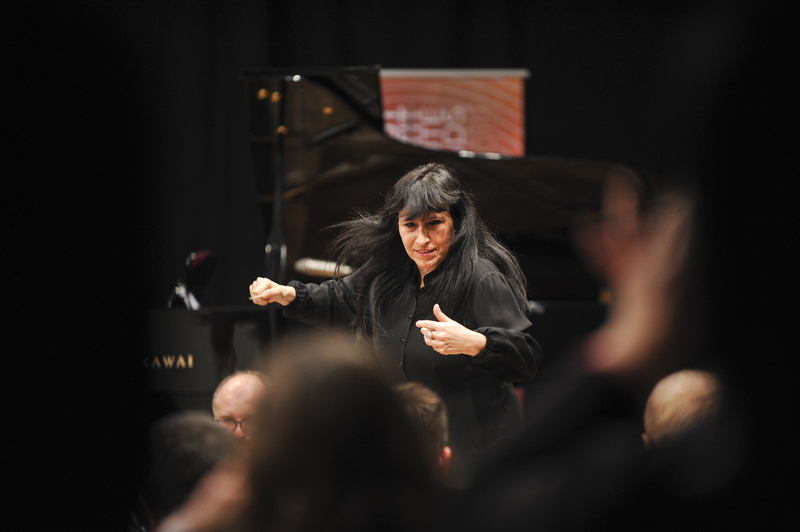 Correction: A previous edition of this article stated that Nathalie Marin is the conductor of the Kosovo Philharmonic. She is the resident conductor – this edit was made on January 15.